Opening Tuesday, October 17 at Dia:Chelsea. On view through June 2. The space at Dia:Chelsea is big and expansive, as it used to belong to the Alamo Marble Company. This makes it a particularly good fit for Rita McBride’s Particulates, a light sculpture installation consisting of sixteen lasers, water molecules, “surfactant compounds,” and appropriately, some marble dust. The result of this interesting collection of materials is a recreation of what seems to be the vast expanse of outer space mixed with a neon sci-fi world of the future, which should be good news to the people who have always wanted to feel enveloped in the galactic void but do not have the means to actually get up there. For those who cannot make it to the exhibit in-person, there is also a livestream of it. Saturday, October 21 at PARTICIPANT, INC., 3 pm to 6 pm. 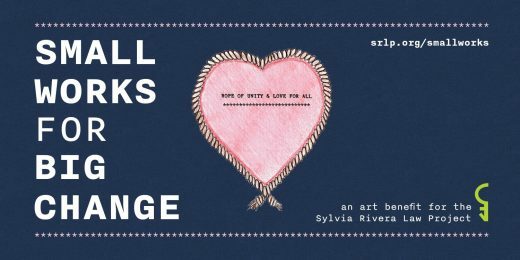 It is time once again for Small Works For Big Change, an annual art benefit for the Sylvia Rivera Law Project. SRLP is an organization working to provide legal assistance to trans, intersex, or gender non-conforming people of color and/or low-income individuals. The event itself is an art auction, which is typically thought of as an upper-crust affair full of big spenders wearing fancy dresses. While the aforementioned big spenders may very well be present, the afternoon has no admission fee and will be showcasing a wide variety of work by an impressive array of queer and trans artists. The evening will be emcee’d by Sister Lotti Da of the drag-centric activist and street performance group Sisters of Perpetual Indulgence, which seems far more fitting than one of those cartoonish and fast-talking old white auctioneers I assume come with every auction-related event. Opening Friday, October 20 at Tiger Strikes Asteroid New York, 6 pm to 9 pm. On view through November 19. We Will Win is a solo exhibition by Haitian artist and teacher Didier William, who makes mixed-media paintings rife with multitudes of textures and tones. This reliance on many methods of creation is no accident, as the content of his work also appears to reflect this multifaceted approach. 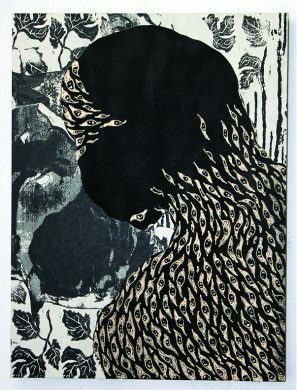 What looks like a human figure also looks like a shadowy void or an abstract pattern; William told art scholar Jerry Philogene in 2015 that this blurring of bodies in his work aimed to reflect “emotional and cultural gymnastics” that black and brown bodies “have to play in order to negotiate and navigate the world around us.” His work also blurs other binaries of gender, history, and culture, and takes imagery like that of French Colonialism into his own hands. Opening Saturday, October 21 at 630 Flushing Avenue, 6 pm to 10 pm. On view through November 12. Yes, the title just keeps getting longer. Erin Davis and Max C Lee’s “re”curring art show in the former Pfizer building on Flushing Avenue is happening for the 15th time, with no shortage of new and interesting artistic offerings. The show’s unconventional location will also be smartly utilized in works like William Miller’s performance about a failed trial-drug for Huntington’s disease designed by Pfizer, which will be performed by Miller (who has Huntington’s himself) in a former pill production facility in the building. 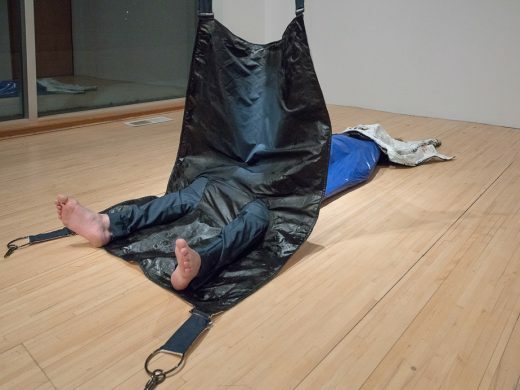 The loose theme for the exhibition is bodily awareness, and the show also features works that deal with voluntarily-imposed bodily limitations, xenophobia when traveling, power structures determined by race, and more.